The Fed is expected to hike interest rates next Wednesday. Rate hikes in the current rate hike cycle have been a short term bearish factor for the stock market. The stock market has tended to go down or swing sideways during the next 2 weeks after a rate hike. Here’s what happened to the S&P 500 after each rate hike in the current rate hike cycle. Click here for the Excel file. The S&P 500 fell for a few days after this rate hike. The stock market didn’t go up by much in the 2 weeks after this rate hike. The stock market swung sideways during the 2 weeks after this rate hike. The stock market trended downwards in the month after this rate hike. The stock market swung sideways in the 1 month after this rate hike. The stock market cratered after this rate hike. The Fed will probably hike rates next Wednesday (June 13, 2018). 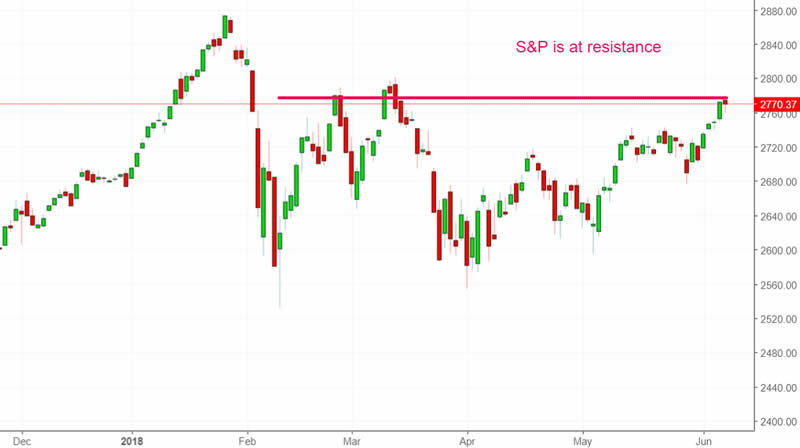 With the S&P 500 near resistance, this rate hike is a short term bearish factor for the stock market. The stock market will probably either swing sideways or make a pullback. However, rate hikes = a medium-long term bullish factor for the stock market (see study). So short term weakness, medium-long term bullish. Focus on the medium-long term, which is much easier to predict than the short term.